Become fluent in the language you love. 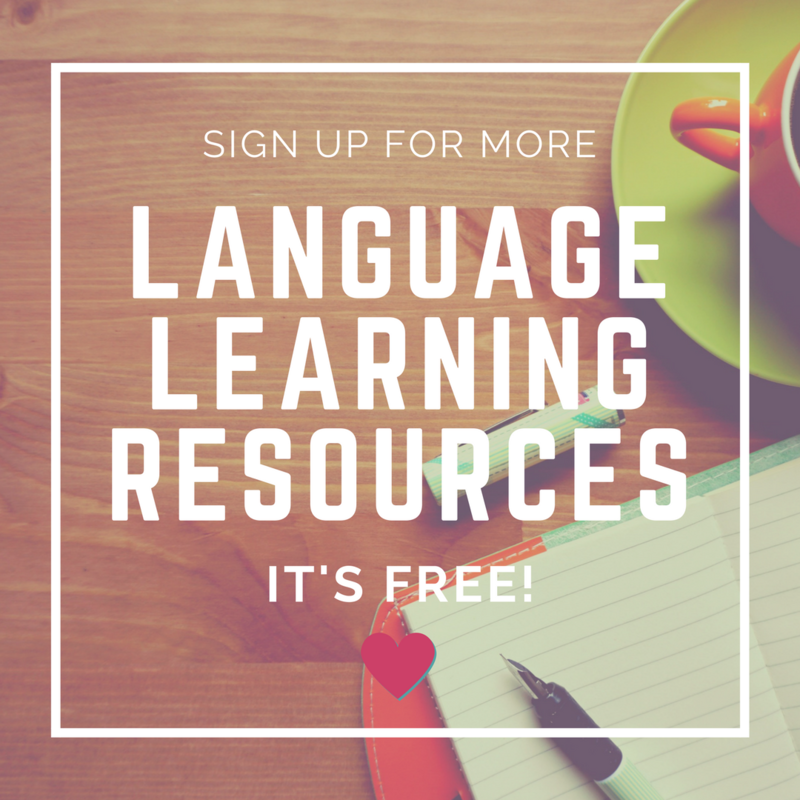 Learn it in a way that works for you by creating your own language course! Nothing is more frustrating than trying to learn a language in a packed class and feeling you’re going so slowly (or so quickly!). Add that to the feeling of falling behind when you skip a lesson (because you had to stay late at work!) or that pit in your stomach that moves in when you are about to speak in front of your other classmates and you can’t find the right word (you forgot it again!)! You can’t even enjoying the fact that you are actually speaking the language you love as your fear of making mistakes just doesn’t let you – along with the recurring thought that you should be much further ahead by now in your learning. Yet, you love Italian. You love Spanish. You love French. You love English. You have a goal, an objective that you deserve to achieve. You’ve chosen to learn this language for a reason. A reason that is so dear to you -Yes! That one! You want to speak and communicate in the language you love so that you can access to a new culture and a whole new world of adventures. And you also want to enjoy learning it all the way through. That’s what I want to help you to do with the Personal Learning Programme. THE PERSONAL LEARNING PROGRAMME is a personalised language learning programme including one to one learning sessions, self guided study activities and practice designed just for you to help you become a confident speaker of Italian, Spanish, French or English, especially if standardised classroom programmes and methodologies, lack of time or persistence have been preventing you from learning the language you’ve always desired to learn. Hi, my name’s Erminia Pedata, Ermy for my friends (and yes! That’s Seville in the background!). As a language learner who has learned four different languages herself and as an experienced language teacher I identify with your learning frustrations very much because I used to be exactly where you are right now. After hearing from dozens of language students who struggle with these same issues, I wanted to help. I discovered that most aspiring language learners struggle with one or more of these four core problems. If you resonate with any (or all!) of the statements above, take a deep breath because you’re in the right place to find the solution to your problem. The Personal Learning Programme will help you learn either Italian, Spanish, French or English in a way that is suitable and relevant to you. So that you can move on to the fun part: having the time of your life on your next trip abroad. Because I want you to have a trip abroad where you’re no longer a tourist but a keen and confident traveller. I want your adventure abroad to be filled not only with amazing views but also with joyous moments, friendly people and interesting conversations that feed your mind and soul. I want you to be able to speak the language you love confidently and create memories that last a life time. If you’re ready to make this happen, the Personal Learning Programme is for you. A FREE Discovery Session on Skype with me to discuss and clarify your learning needs and goals. Book it now right here! A learning curriculum created and designed just for you that will help you learn just what you really need. This is YOUR language course, that’s why I don’t use any standardised language book or course. I create the resources for your course personally to cater to your needs. Guided self study activities to help you develop your language learning skills every day. Helpful (and pretty!) learning sheets with the vocabulary and grammar you’ll learn all organised in one place. Learning strategies to set you up for successful language learning also once the programme is completed. Support via email throughout the whole duration of the course, because I know that questions will pop up in your mind after our learning session, so I’ll be there to help you. 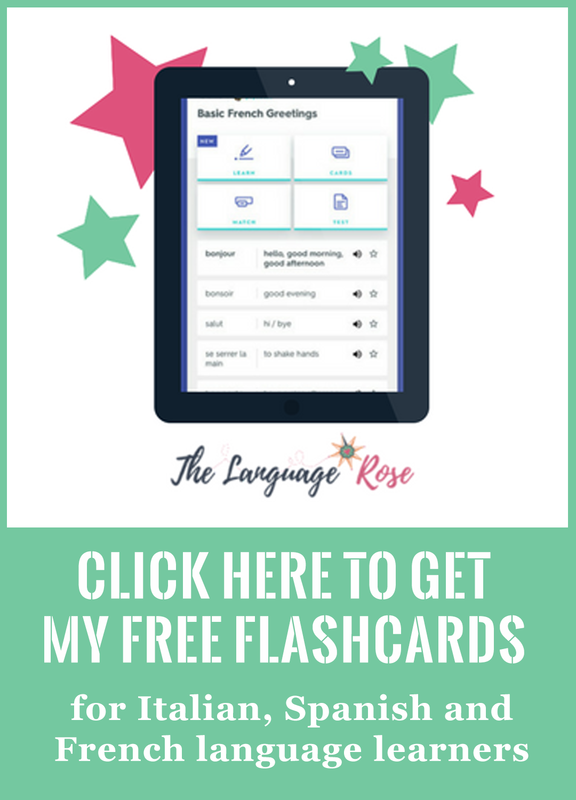 Life time access to my online Superstar Language Learners’ class- This class includes the vocabulary you’ll be learning during your learning sessions (and more!). In this online class you’ll be able to play with online flashcards that will help you keep up your languages skills. Conversation session – Every 5 learning sessions you’ll have a 15-minute conversation practice with me to help you develop your communication skills and confidence in using the language you love – there’s no point in learning a language if you can’t enjoy speaking it, right? Recorded lessons – You may record the learning sessions for self study purpose, if you feel that this helps you. A textbook for the course. A standardised programme designed just to pass an exam. A didactic way of delivering lessons – most of the time I’ll help you figure things out rather than just telling you, so you’ll remember then better. A teacher that takes herself far too seriously – you’re invited to have a laugh too. Want to know more details and find out if I’m the right teacher for you? Apply now to get a Free Discovery Session! WHAT LANGUAGES CAN YOU LEARN IN THIS PROGRAMME? The languages available are Italian, Spanish, English and French and there is a limited number of spots for each one of them. Apply now to book your FREE Discovery Session! I’m not sure I can afford this. I understand you. Because I’ve been there too. This is an investment in yourself. And when you invest in yourself your motivation to succeed increase. You have an important reason why you want to learn Italian, Spanish, French or English and if you want to get there in a way that doesn’t waste your time, energy and money and help you to be committed, this learning programme will help you do this. I honestly believe this programme is filled with tools that will ultimately save you time, dead ends and money. Yes, there are places online where you can get language practice for free, but they hardly offer what the Personal Learning Programme gives you in terms of personalisation, support and coaching. 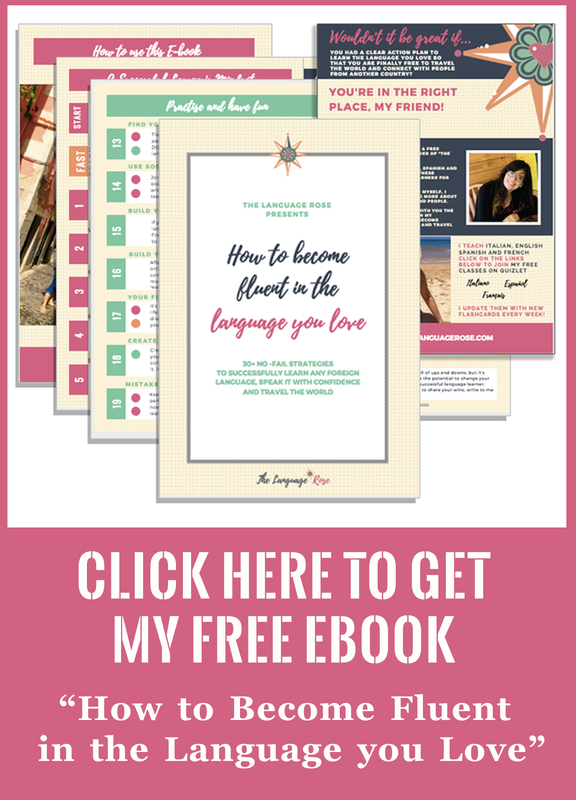 This is an invitation to create your unique language course that will help you speak confidently the language you love without wasting your time, money and energy. I know it’s important to be mindful of every penny you invest, especially if you’re a student. That’s why my Personal Learning Programme comes with a 100% satisfaction guarantee. If after having had your discovery session and first learning session, you feel that this programme is not a good fit for you, please write to me to get a refund*. There is a firm deadline to ask for a refund, which is before you book your second learning session. I shall require your full, completed learning sheets, homework and a detailed explanation of what didn’t work for you so I can continue to improve. The reason I ask for your completed coursework is because I know that if you take action on the exercises, you’ll get tremendous value and make progress towards your learning goals. *You will be refunded the whole amount of the programme and only be charged 39 pounds to cover administration expenses. Apply now and as this is a one to one programme and I have a limited number of spots for each language available (Italian, Spanish, English and French). the time and commitment, be aware that you will be scheduling your own learning sessions to fit your own schedule. Here’s the deal : if yii abt to make consistent progress, you need to make sure you schedule you learning sessions periodically. If you have a learning session every three weeks or every two months (! ), it won’t get you the results that you’re looking for and eventually it’ll be just a waste of your time, money and energy. And, I seriously don’t want that! You deserve to have the best learning experience and get the most out of it, this is why we will agree on a time limit to complete the programme ( depending on your learning goals) . You may do so that but bear in mind that near holiday time, I tend to get fully booked quite quickly. Plus, this programme requires lots of preparation from my side too so that it’s suitable to you, this is why I only have a very limited number of spots available. You may also book your spot right now and schedule your learning sessions nearer your holiday time, if you think it works for you. Also, remember that a language isn’t a subject you can cram! You need time and consistency to learn a language properly, so it’s always better to start to learn it as soon as possible and keep it up -and I shall give you strategies and resources to do that too throughout the programme! You are a curious life long learner, a traveller, an adventurer, a language addict, a creative-individual-with itchy feet, with a burning desire to communicate in Italian, Spanish, French or English. You’re willing to commit to learn a language not only with your teacher but also in your own time. You need some accountability to manage to achieve point 2! You want to get to speak confidently (not only learn!) the language you love. You want a personalised programme that helps you to learn just what you need in order to speak the language you love. You want to learn a language in a way that is right for you. You’ve tried many standardised language courses but you couldn’t find any that worked for you. You enjoy learning new things and a new challenge. You’re willing to get out of your comfort zone. You think you can learn a language only by showing up to face to face lessons without investing some of your own time in self study and learning. You’re learning the language *just* to pass an exam or because your employer would like you to do so. You don’t have the willingness to commit at least at least 10 minutes a day to keep your language up. You think that this programme will bring you from zero to completely fluent in a month or so – you’ll get to a reasonable level of fluency according to your starting point, effort and commitment level. You feel that the Language Rose Learning Philosophy does not resonate with you. Still in doubt and want to find out more? Fill in the application and we can chat about this during the Free Discovery Session. Find out if we get on well! The answers you’ll provide in the application will be kept confidential and will serve for the sole purpose of the Discovery Session. Have you got more questions? Please check out this F.A.Q.